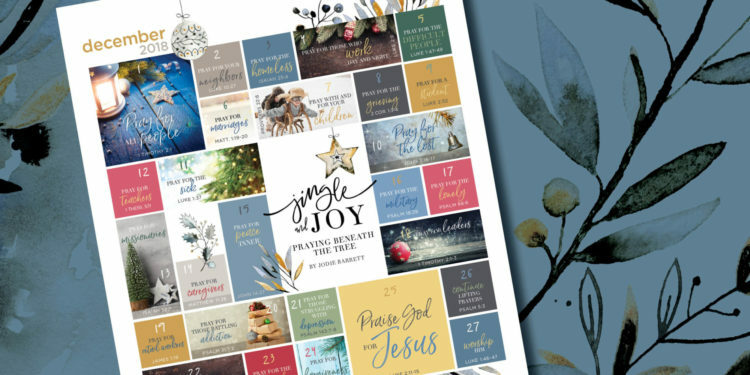 My friend Jodie Barrett wrote Jingle and Joy, an Advent devotional, designed to help busy women find meaning in this season through prayer—specifically, praying beneath the tree for the things the Bible tells us to pray. This month’s calendar uses her prompts and scripture references, designed to be used as a perpetual calendar (which means it can be used year after year)—but I loved it and wanted to share with you also. Please bear with me for breaking format and tradition for this one month only :-). And check out her devotional and her ministry page.